If given his way, President Bush appears ready to perform a radical environectomy on the federal budget for Fiscal Year (FY) 2002. Although there are a few environmental winners in the proposed budget, such as the National Institute of Environmental Health Sciences and the states that will receive large wastewater treatment grants, some of the biggest losers in the entire budget include environmental research programs sponsored by the U.S. Department of Energy (DOE), U.S. Department of Interior's U.S. Geological Survey (USGS) and the U.S. Environmental Protection Agency (EPA). Released on April 9, the Bush budget would cut funding for DOE renewable energy programs from $376 million in fiscal year 2001 to $186 million in fiscal 2002. According to DOE Secretary Spencer Abraham, renewable energy and efficiency programs are examples of DOE programs that "have produced few, if any benefits." Research on energy use in transportation by 6.3 percent to $239 million. Under the Bush plan, funding for the water resources division of USGS would drop from $883 million in FY 2001 to $813 million in FY 2002, a 22 percent cut. Facing the biggest cut - a 71 percent drop to $4 million - is the USGS Toxic Substances Hydrology program. Since 1982, this program has studied how pollutants move and break down over the years in aquifers and watersheds. If the Bush plan were enacted, all of the program's research would probably be shut down. In addition, funding for scientific activities at the U.S. Environmental Protection Agency would be cut by 7.8 percent. The office would receive $535 million in FY 2002, down from $574 million in FY 2001. To view the Bush administration's proposed FY 2002 budget, check out www.whitehouse.gov/omb/budget. 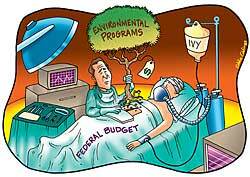 Many have expressed concern over the budget's proposed cuts for scientific research. In a recent letter to President Bush, the National Council for Science and the Environment (www.cnie.org), a coalition of academic, scientific, environmental and business organizations, urges President Bush to "provide significantly increased funding for scientific programs" that enhance knowledge about the environment. The council also requests that the president increase funding for programs such as the National Science Foundation grants in environmental science and the National Oceanic and Atmospheric Administration, which studies issues such as climate change. Likewise, Editor-in-Chief Morton Zuckerman points out in his U.S. New & World Report editorial, dated June 4, that we must continue to support vital scientific research that has propelled our nation's economic growth and productivity. According to Zuckerman, "Our well-being today is based on the science of yesterday. Most of the truly great scientists of today will happily tell you they stand 'on the shoulders of giants' who contributed in the past." Even if it brings no immediate benefits, basic scientific research that advances the frontiers of knowledge is necessary and should be supported by the federal government. Environmental science is becoming an increasingly interdisciplinary field. Engineering, mathematics, life sciences and the physical sciences all play a role in helping us understand how to better control industrial pollution and protect our natural resources. Therefore, governmental funding needs to be devoted to a broad cross-section of environmental research programs, not just a few selected ones. It's important that the United States maintain its role as a world leader in scientific research because by the year 2050 we are looking at a projected world population of 10 billion. A booming human population translates into a greater impact on natural resources and more industrialization with its accompanying pollution. In order to come up with solutions to these looming problems, it's crucial that our government promote increased funding for today's environmental research. Has your facility been formally recognized in 2000 or 2001 for pollution prevention strategies, innovative design or other environmental accomplishments? If so, please let us know and we'll consider it for one of our Facilities of the Year, which will be featured in our December 2001 issue. Every year we salute the top industrial plants, wastewater treatment operations, landfills and other types of facilities that have been singled out for outstanding environmental achievements by governmental regulators, trade associations or other professional groups. If you are interested, please visit our Web site at www.eponline.com and fill out our questionnaire by August 1, 2001.